As a lover of Jane Austen and Pride and Prejudice it was a no-brainer I would love Alex Field's picture book Mr Darcy. 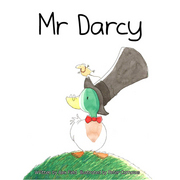 Mr Darcy is a duck who lives by himself at Pemberley Park 'where the trees blossomed and the lake sparkled'. Although he is lonely he feels too important to accept an invitation to tea from Lizzy and her sisters. Disaster occurs when Mr Darcy falls in a puddle (a little smile crossed my lips with visions of Mr Darcy from the BBC series emerging from the lake!). Lizzy, her sisters and their friends (including Bingley the horse) help free Mr Darcy and, realising the value of friendship, he accepts Lizzy's invitation. The text and illustrations combine perfectly to bring this delightful story to life. Peter Carnavas once again shows why he is an award-winning illustrator. The illustrations are uncluttered yet full of energy, movement and emotional integrity. Mr Darcy is the stand-out character and his journey is brilliantly portrayed. Plenty of white space keeps the focus on the characters and does not distract the reader, ensuring that the message of the text is conveyed but never in a didactic manner. Children and parents will both love this gentle and amusing story.